Fresh Fruits Slot Machines Play Online - UK Slots with Bonus Rounds! Endorphina has been releasing great slots for many years — the machines of this company have a chic plot and good graphics. This slot is sure to appeal to users: its plot tells about delicious fruits, which are ready giving the gambler a unique opportunity for generous winnings. The color scale of this Endorphina slot simply impresses with its brightness. Also, the casino visitor will be delighted with the machine animation, which gives the slot more realism. Due to its thematic signs, displayed on reels, the unit becomes more attractive and interesting. Jolly music highlights the quality of slot and also makes the gameplay more exciting and memorable. To begin gambling at Fresh Fruits slots, the player must look at the menu section with all the data about these machines. Here the player sees the PayTable and learns more about the existing combinations, signs, bonus round, as well as the risk game. The Lines button lets the gambler selecting the desired quantity of the rows that are active in the spin. The numbers on the sides of the playing field also contribute to changing the lines involved in the game — just press any number: it is extremely convenient. The Bet lets you betting on 1 payline, and total Bet will allow you to bet on all lines (40 of them), so it’s better for the player to think everything over and decide on the type of bet. The top of the game board lets you adjusting the sound or open the game in a large window (remember: you must not download this game — just open it and enjoy the process). 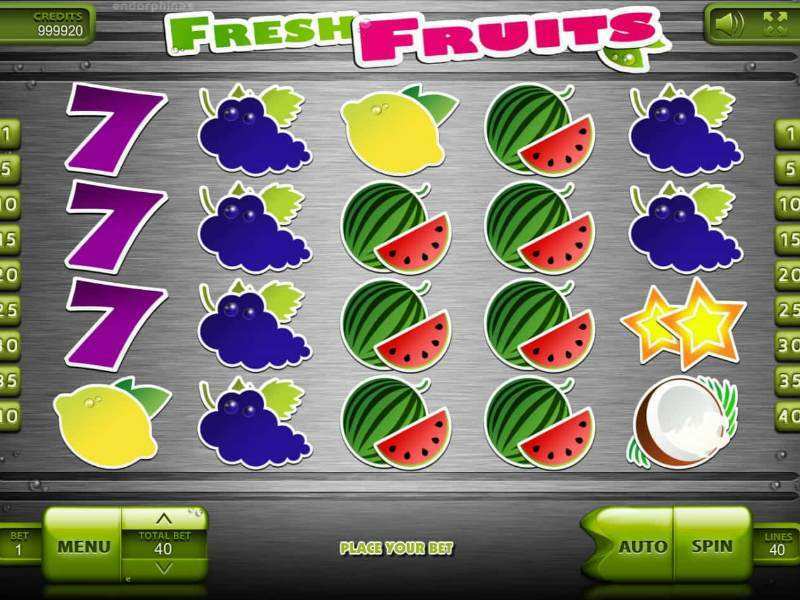 Fresh Fruits slots give several options for picking the number of reels and lines to play at, so the player must choose the right one for himself. Experienced players often use here auto games, while beginners pick single spins option. Auto Spin starts the slot in automatic mode; however to start the machine in manual mode, it’s enough to press Spin. After the spin of the reels, the gambler needs waiting for a positive result, which can be activated by the risk game. This round can be opened after the player makes any winning combination and presses on the highlighted button Take Risk. After that, the gambler will get to the card round, where he’ll see 4 closed and 1 open cards. The latter will belong to the “dealer”, but the player’s task is to point out 1 of the remaining cards that is “higher” than the dealer’s one. For instance, even when a dealer’s card is Ace, Joker of the gambler “beats” it, and the player wins. When this action is completed successfully, the player is rewarded. This stunning machine will please all players with its extraordinary quality, despite the fact that its plot is standard – fruit. You can win here up to 20,000, but before betting and risking play free Fresh Fruits casino slot machine. Try your Fortune at risky round, with which you can increase your own payments for victorious backs. Use Scatter options and win more real money. 0 responses to "Fresh Fruits Slot"